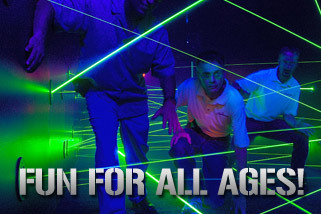 Sharpen your ninja skills as you twist, duck and crawl your way through an intricate web of lasers. 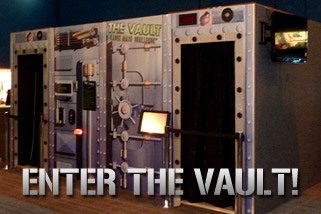 Try to make it through the vault and hit your mission buttons without being zapped by the laser beams. Sound a little easy? Well you have to be flexible and quick through these laser beams to make it through to the other side. Trip too many lasers and you’ll have to start all over again." Be fast, stop the timer and outrank your friends. Try the challenge again and again to beat the clock and your best score. Run, jump and chop your way to a high score in Beam Buster, made for the young and young at heart! If you love letting loose at a quick pace, you will love Beam Buster. In Beam Buster, the more lasers you break the higher score you can achieve but you only have 30 seconds so give it your all! Make your next event an adventure! For more information on hosting your event, contact us at (480) 270-6200 or email info@odyseamirrormaze.com. © Copyright 2018 OdySea Maze, LLC.